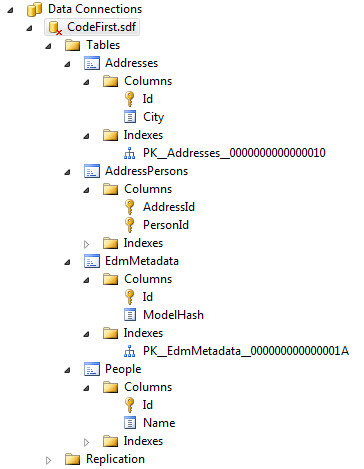 Entity Framework (EF) recently started supporting code-first development. This means that we don't have to create our database first before we can write any code. It allows developers to create their models (business entities, data objects etc) and then it will automatically create the database after very little configuration. I wanted to see how EF handles relationships. 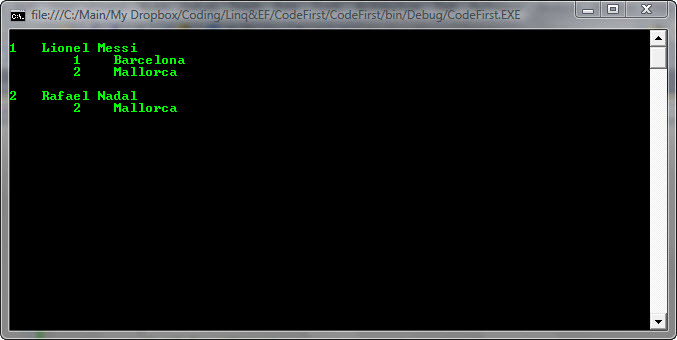 So I created this sample to demonstrate how EF code first handles many-to-many relationship. For my app, the scenario is very simple. We have Person and Address entities. A person can have many addresses and an Address can belong to many persons. So, its a many to many relationship. To get up and running with an app, all the code I needed to write was this. I also needed to make a small entry for connection string in the app.config as shown below. In the database, you can see that EF created Persons, Addresses and AddressPersons table (junction table) to achieve many-to-many relationship.